Allen Conway's Blog: Visual Studio Live Orlando is almost here – December 5-9. Are you planning to go? Visual Studio Live Orlando is almost here – December 5-9. Are you planning to go? Visual Studio Live Orlando is just about here, and if you have not attended before or are a past attendee, check it out! It’s a great opportunity to interact one-on-one with industry experts and Microsoft insiders, like Rachel Appel, Andrew Brust, Scott Cate, Billy Hollis and Rocky Lhotka on everything from .NET 4/Visual Studio 2010 and Silverlight to cloud computing, Windows Phone 7 development and HTML5. Plus, why wouldn’t you want to escape the December cold and be here in sunny Florida? 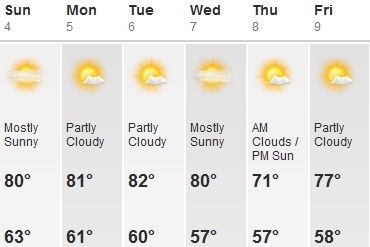 Can you handle the ordered up weather below for this upcoming week at the conference? This will be my 4th time to VSLive! and I think the knowledge and networking opportunities gained are worth the conference price 10 fold. I am asked so often how from new or junior programmers about how they can grow and advance their career. Attending a 1st class conference like this and learning from the experts is definitely a step in the right direction. Interested in attending? There is still time, and if you are a programmer local to Central Florida come and see just how great this conference really is. Check out the special group rates offered for companies that bring 3 or more people. Register today at http://bit.ly/VSLOL11Reg.